Net sales decreased by 4% to SEK 16,587m (17,279). Organic sales, which exclude exchange rate effects, acquisitions and divestments, decreased by 3%, of which price/mix accounted for –3% and volume for 0%. 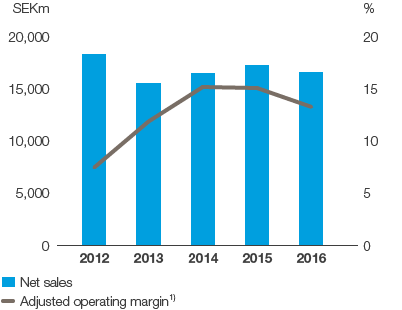 The closure of a publication paper machine during the fourth quarter of 2015 decreased net sales by 3%. Exchange rate effects decreased net sales by 1%. 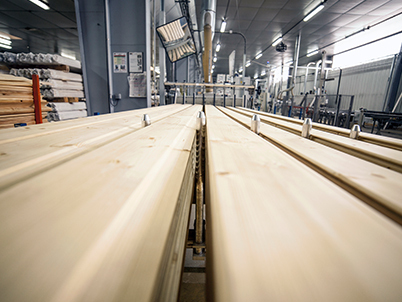 Solid-wood products showed lower prices (including exchange rate effects) and higher volumes. Pulp and kraftliner showed lower prices (including exchange rate effects) and lower volumes. Publication papers showed higher prices (including exchange rate effects) and lower volumes. The adjusted operating profit1) decreased by 15% to SEK 2,211m (2,605). Lower prices (including exchange rate effects) and higher energy costs had a negative earnings effect. Lower distribution costs and raw material costs had a positive earnings effect. The adjusted return on capital employed1) was 5.7% (6.9). The operating cash surplus amounted to SEK 2,639m (3,319). Operating cash flow amounted to SEK 1,884m (2,501). Capital expenditures amounted to SEK 3,190m (1,815). 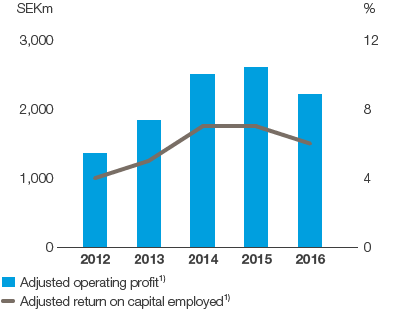 Return on capital employed is to be in the top quartile of the industry over a business cycle.